Helicopter money is not just another version of unconventional monetary policy. Using simple central bank and government balance sheets, this column explains how helicopter money today is different from what Milton Friedman imagined back in 1969 – it is expansionary fiscal policy financed by central bank money. We are wary of joining the cacophony of commentators on helicopter money, but our sense is that the discussion could use a bit of structure. So, as textbook authors, we aim to provide some pedagogy. (For examples of previous writing, see Bernanke 2016, Baldwin 2016 and Buiter 2014). To understand why helicopter money is not just another version of unconventional monetary policy, we need to describe both a bit of economic theory and some relevant operational practice. We use simple balance sheets of the central bank and the government to explain. First, some background. In an essay published in 1969, Milton Friedman described what he believed to be a surefire mechanism that central banks could use to generate inflation (were that desired): drop currency straight from helicopters on to the population, while promising never to remove it from circulation. The result would be higher prices (and, if you keep doing this, inflation). In his thought experiment, Friedman assumed that by altering the monetary base – the sum of currency and commercial bank reserve deposits at the Fed – the central bank could control the supply of transactions money (such as the aggregate M2). Second, he assumed that reserves were not compensated: that is, commercial bank holdings at the central bank had a zero interest rate. Now, there are three problems with this thought experiment. First, transferring funds to households is what fiscal policymakers do, not central bankers. The latter issue central bank money to acquire assets. Second, except when interest rates are at the effective lower bound, monetary policymakers today control interest rates, not the monetary base (or another monetary aggregate). The monetary base is determined by the demand of individuals to hold currency and of banks to hold reserves at the central bank’s interest rate target. In practical terms, this means that the central bank cannot credibly promise to permanently increase the monetary base. Third, 21st century central banks pay interest on reserves. And they do so precisely to control the level of interest rates in the economy. What this means is that the notion of helicopter money today is necessarily different from what Friedman had in mind. To explain the modern concept, we use the balance sheets of the central bank, of the Treasury, and of the consolidated government, which combines the first two. 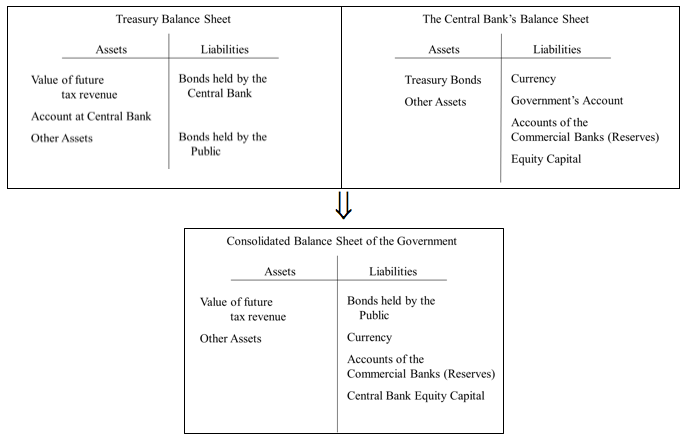 Figure 1 shows the basic structure of fiscal and monetary authority balance sheets. We usually think about the central bank as being a part of the government. In an economic sense, this means consolidating the two balance sheets into one. When we do that, the “Bonds held by the Central Bank” on the liabilities side of the Treasury’s balance sheet cancel the central bank’s holdings of “Treasury Bonds” on the asset side of its balance sheet. And the “Account at Central Bank” that appears as a Treasury asset cancels the “Government’s Account” on the liability side of the central bank’s balance sheet. The result is in the bottom part of Figure 1. So, in operational terms, what is helicopter money today? As we understand it, helicopter money is a fiscal expansion that is financed by central bank money rather than by bonds. This means that it is not about $100 bills dropping from the sky, à la Friedman. Nor is it either quantitative easing (QE) per se, which can occur when fiscal policy tightens, eases, or remains unchanged; or an intergovernmental transfer, like the remittance of interest income from the central bank to the Treasury. Instead, helicopter money is a multi-stage process that we can imagine starting with the central bank crediting the Treasury’s account. This increase in one central bank liability must be balanced either by a decrease in another liability or by an increase in an asset. In the first case, the only liability that could fall at the central bank’s discretion is its equity – for ease of exposition, we ignore this in what follows. The other alternative, and the one that is more commonly discussed, is that the Treasury issues a bond to the central bank in exchange for an increase in their account balance. (For simplicity, assume there are ways around the legal constraint that prevents many central banks from purchasing bonds directly from the fiscal authority.) Figure 2 shows the changes in the balance sheets for an amount of $100. Figure 2 shows that, in exchange for $100 of Treasury Bonds, the central bank has credited the Treasury’s account with $100. In each case, one entity’s asset is the other’s liability, so the consolidated balance sheet shows no change – at least, not yet. The next step in this description of helicopter money is that the Treasury distributes the $100. For example, it could transfer money to individuals, depositing it in their bank account, or it could use the funds to build a new bridge or renovate a rundown airport. (The government also could reduce taxes, but this functions like a transfer to the taxpayer when the tax is due.) In each case, the $100 is given to someone who deposits it in their commercial bank. When the payment clears, this shifts the liability on the central bank’s balance sheet from the Government Account to the Accounts of the Commercial Banks, as shown in Figure 3. But, what happens to these commercial bank reserves? Prior to the Global Crisis, when central banks like the Federal Reserve targeted a market interest rate, the quantity of reserves in the banking system was determined by commercial bank demand. That is, the central bank would elastically supply whatever reserves the banks wished to hold at the central bank’s interest rate target. In that setting, the only way to get banks to increase their reserve holdings would be to lower market interest rates. This has the extremely important implication that in the absence of a change in the target rate, commercial banks would exchange the additional reserves for Treasury Bonds, so that the balance sheets look like Figure 4. Figure 4 shows the final balance sheet position following a $100 ‘helicopter money’ drop for the pre-Crisis case of interest rate targeting away from the effective lower bound. That is, since reserves are demand determined, unless the central bank alters the interest rate target, its balance sheet is unchanged and the Treasury has engaged in conventional debt financed fiscal policy. Put differently, the helicopter money disappears. The Treasury issues a bond to the central bank in exchange for a deposit balance. The Treasury spends the funds in its central bank deposit, shifting the central bank’s liability to commercial bank reserves and leading to an increase in expected future tax revenues (a Treasury asset). Commercial banks, not wanting the additional reserves, exchange them for a government bond, reducing central bank assets and liabilities. The central bank accommodates this exchange unless it wishes to alter the interest rate target. The result is an increase in the Treasury’s issue of publicly held bonds, rather than an increase in central bank money. Admittedly, no one has suggested the use of helicopter money during normal times when bank demand for reserves is downward-sloping and the central bank accommodates that demand to hit its rate target. (For description of Fed operating procedures in this setting, see Figure 1 in Cecchetti and Schoenholtz 2015.) Instead, the recommendation is that it be used as a last resort – one that comes after QE has been exhausted and interest rates have plunged to the effective lower bound. At that stage, reserves have been supplied massively in excess of the volume needed to hit any interest rate target and banks’ demand for reserves is fully elastic so that they will be indifferent between holding billions more or less (see Figure 2 in Cecchetti and Schoenholtz 2015). Put differently, once QE drives interest rates to zero or lower, the level of reserves is supply determined. That means that when a commercial bank goes to the central bank to try to exchange the additional reserves for bonds (in Step 3 above), the central bank will refuse. As a result, Figure 3 describes the final position of the balance sheets. Does this make any difference? Is helicopter money in this setting any different from standard QE when the Fed purchased long-term bonds in exchange for reserves in an effort to flatten the yield curve? Since the alternative is for the fiscal authorities to sell long-term bonds, the answer is no. To see why, note first that, following Steps 1 and 2, the consolidated government bank balance sheet shows a $100 increase in both reserve liabilities and the present value of future tax revenue assets. Recall that, in contrast to Friedman’s world, central banks now pay interest on excess reserves. So, banks are compensated for the additional $100 they hold in their account at the central bank at the zero-maturity government rate. If the yield curve still has any upward slope, issuing reserves rather than long-term bonds to finance fiscal expenditure will appear cheaper in terms of current debt service. However, this apparent saving is an illusion because it ignores interest rate risk. If the government chooses to issue long-term debt, it must compensate investors to take this risk; if it issues short, the government itself assumes the risk. So, is there really no difference between conventional bond-financed fiscal expansion and helicopter money? There are a few. First, at the effective lower bound, you might think of helicopter money as a combination of: (1) bond-financed fiscal expansion; and (2) QE in which the monetary authority creates central bank money to acquire the bonds. Second, as several commentators have pointed out, helicopter money may strain the relationship between the fiscal and monetary authority. Forcing the central bank to engage in this practice undermines its independence, creating a situation commonly known as ‘fiscal dominance’. Third, so long as its currency has value, a central bank does not face rollover risk, so a fiscal expansion financed by central bank money is more stable than one financed by bond issuance. Put slightly differently, we can think of reserves as floating rate consols or perpetuities. But is rollover risk really a concern for the governments of most advanced economies? We doubt it. We are left with a simple conclusion. Helicopter money today is different from what Milton Friedman imagined; it is expansionary fiscal policy financed by central bank money. And, if interest rates have fallen to the effective lower bound, it is neither more nor less powerful than any bond-financed cut in taxes or increase in government spending in combination with QE. Baldwin, R. (2016), “Helicopter money: Views of leading economists”, VoxEU.org, 13 April. Bernanke, B S. (2016), “What tools does the Fed have left? Part 3: Helicopter money”, Brookings Institution, 11 April. Cecchetti, S. G. and K. L. Schoenholtz (2015), “How the Fed will tighten”, www.moneyandbanking.com, 10 August. Friedman, M. (1969), “The Optimum Quantity of Money”, in Milton Friedman, The Optimum Quantity of Money and Other Essays, Chicago: Adline Publishing Company, pp. 1-50.